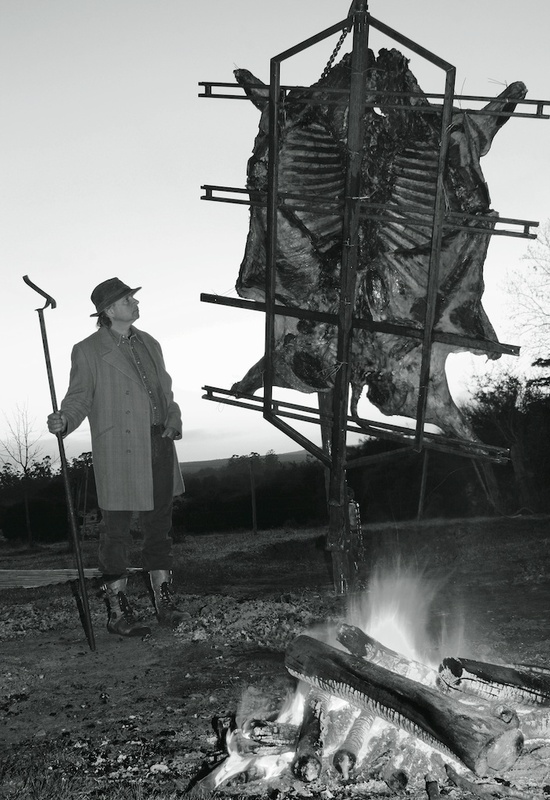 ACL Appreciation: Francis Mallmann | A Continuous Lean. The master in New York, and in his element. Man likes to cook over fire, that is his nature. Whether on a spit, fieldstone grill or Weber, he is predisposed to turn over a steak, rack of lamb, and maybe some salmon, eggplant, and, hey, why not peaches in season? He drinks while he does this, he enjoys the company of other men and properly feels that all is right with the world. So we were very excited when grill maestro Francis Mallmann recently came to town to cook dinner at Reynard. The Argentinian, perhaps South America’s most famous chef, is author of Seven Fires: Grilling Argentine Way (Artisan). It’s a terrific book, even if you’re not planning to put a splayed lamb over a fire for seven hours this weekend. Written with the stalwart New Yorker, Peter Kaminsky (himself a devoted fly fisherman), the book is filled with incredible photographs from Patagonia that are better than a Ralph Lauren mood board. Mallmann, who trained in classical French kitchens, has moved away from that refined technique in favor of the simple payoff of cooking over wood fires. The recipes are straightforward enough, but the judgment that comes from experience is key, especially if you’re going to cook a salmon under a bank of coals. Mallmann arrived at the Wythe Hotel for Reynard’s Dinner With Friends series. He brought a few men from his Buenos Aires restaurant, and decades of expertise. They served oysters, empanadas, a wonderful steak, some stone fruit–everything prepared with heat from the fire. But the main attraction was a couple of striped bass that were buried in salt. They were cooked over coals, but also beneath them–â€œbetween two hellsâ€ Mallmann calls it. It’s ambitious for the home chef, it’s ambitious for the professional. Simply served with a little lemon and aioli and you’re reminded why cooking with fire is an elemental art. 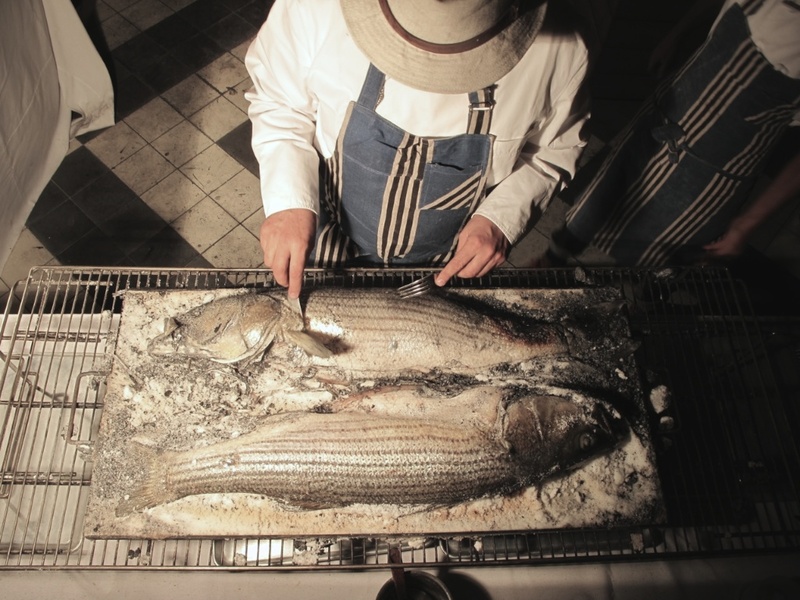 Expert consideration: Francis Mallmann in Argentina. Copyright Â© 2009. Photograph by Peter Kaminsky. Great article!. He has been an inspiration in my cooking and helping charity. My friends and I cook animals whole cow, goats, lambs, llamas etc for and event called Bovinova. It is a wonderful thing to see peoples faces light up when there learn and see new things. Chef Mallman brought back many memories of my childhood in his cookbook that we now share some of those idea with our friends. There is something very Hieronymus Bosch-esque about those splayed carcasses on those racks.